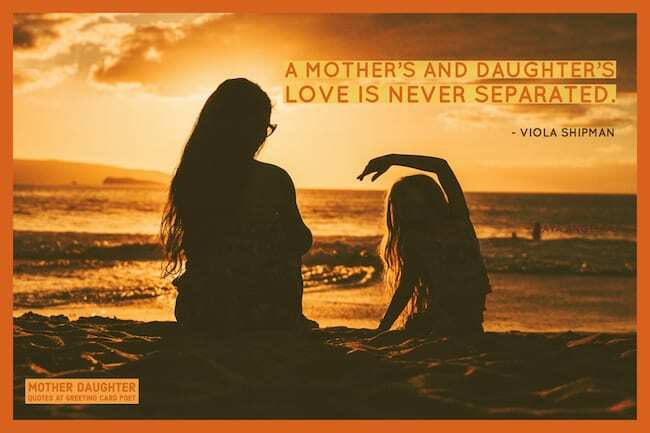 These mother daughter quotes truly reflect this special bond. This relationship is unlike any other. It is loving, unique, selfless, strong, and complex. This relationship is most significant. A mom can be a guide, a role model, and a friend. In turn, her offspring can be a supporter, an inspiration, and a friend. These quotes are endearing, funny, and inspirational. They work well for Mothers Day, Birthday Cards, social media posts, and more. He didn’t realize that love as powerful as your mother’s for you leaves its own mark. Even though we fight and drive each other crazy, we now have this little reminder that our love for one another is greater than anything in this world. I love my mom, no matter what we go through, no matter how much we argue, I know in the end, she’ll always be there for me. Dear daughters, If I could give you one thing in life, I would give you the ability to see yourself through my eyes. 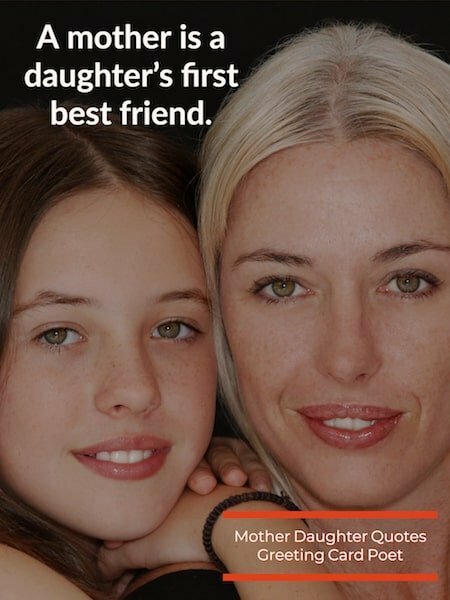 Tip: These Mother Daughter Quotes make excellent photo captions on social media. Mothers and daughters will always share a special bond, though near or far apart, the words that would describe it are written on the heart. There is nothing like the love I have for my daughter. We share every emotion with each other, our hopes, and dreams … We can talk for hours! A mother’s and daughters love is never separated. There is no feeling like that first little smile, your first Mother’s Day, which was so beautiful and sweet to me. The entire day my eyes were on the verge of tears because I was so happy. If I could give my daughter 3 things, it would be the confidence to always know her self-worth, the strength to chase her dreams and the ability to know how truly, deeply loved she is. My mom is literally a part of me. You can’t say that about many people except relatives, and organ donors. If at first you don’t succeed, try doing it the way mom told you in the beginning. It’s not easy being a mom. If it were, dad would do it. A mother’s sacrifice isn’t giving birth, it’s nine months without wine. I just want you to know, if you ever need anything, don’t be shy, OK? There are NO rules in the house. I’m not like a regular mom, I’m a cool mom. I told my mom she was invading my personal space and she said I came out of her personal space. To my daughter. Never forget that I love you. Life is filled with hard times and good times. Learn from everything you can. Be the woman I know you can be. Signed, Mom. We mothers have a wonderfully precious and truly powerful role to play in the future self-images of our daughters. The truth is, the most effective way to inculcate in our daughters a fighting chance at life-long self-love and empowerment is not in the books we read to them, or the workshops we send them to, or the media we do or do not expose them to, or even the things we tell them, rather it is in the reflection of self-love and empowerment they see in us, their mothers. The model of our own empowerment gives our daughters permission to be powerful. Mothers and daughters together are a powerful force to be reckoned with. You know every story, every wound, every memory. Their whole life’s happiness is wrapped up in you… every single second. I tell my daughter every morning, ‘Now, what are the two most important parts of you?’ And she says, ‘My head and my heart.’ Because that’s what I’ve learned in the foxhole: What gets you through life is strength of character and strength of spirit and love. I don’t want my daughter to follow in my footsteps. I want her to walk the path beside me and go even further than I could have ever dreamed. I can’t cherish you to death. We have to raise our children to be the adults that we want them to be, and that starts young. You can’t be so afraid that life will break them that you don’t prepare them for life. And I wonder, if I can ever be like you. A daughter always tries to fit in her mother’s shoes. A mother’s words of encouragement can be the foundation on which greatness is built. The thing about mothers, I want to say, is that once the containment ends and one becomes two, you don’t always fit together so nicely. The living mother-daughter relationship, you learn over and over again, is a constant choice between adaptation and acceptance. Daughter, I want you to forgive easily, laugh loudly and never allow yourself to become the invisible, silent woman that your mother was. Daughter, this is how we soften our hearts and become better human beings. Suddenly, through birthing a daughter, a woman finds herself face to face not only with an infant, a little girl, a woman-to-be, but also with her own unresolved conflicts from the past and her hopes and dreams for the future. As though experiencing an earthquake, mothers of daughters may find their lives shifted, their deep feelings unearthed, the balance struck in all relationships once again off kilter. As for my girls, I’ll raise them to think they breathe fire. She stands firmly on her own two feet and I just behind her; should she ever need me. My mother spoke highly of me, and to me. But more important, she was there with me. She had my back, supported me. This is the role of the mother, and in that visit, I really saw clearly, and for the first time, why a mother is really important. Not just because she feeds and also loves and cuddles and even mollycoddles a child, but because in an interesting and maybe an eerie and unworldly way, she stands in the gap. She stands between the unknown and the known. The mother is only really the mistress of her daughter upon the condition of continually representing herself to her as a model of wisdom and type of perfection. 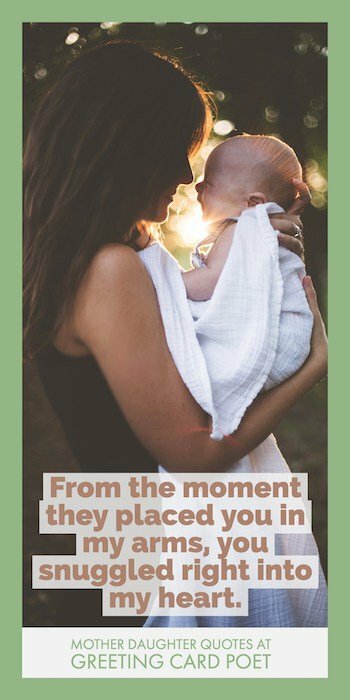 You’re on Mother Daughter quotes page.